You know how when you buy new scrapbooking materials you just have to use them? 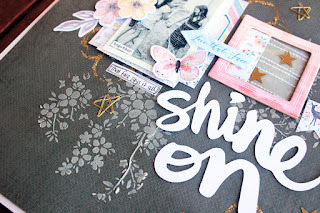 Well that's pretty much how this page came about :) I purchased some gorgeous paper and embellishments from Cocoa Vanilla's More Than Words collection. However I also challenged myself to use an old piece of paper (the grey background) in my layout. I used matte gel medium for the textured flowers, and arrows on the heart. 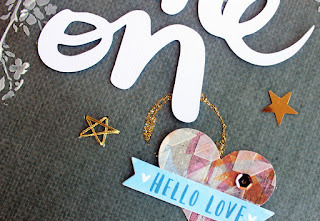 My favourite part of this page is the glittered circles - made using the bottom of a glue bottle, some mod podge and some fine Stampin Up glitter. Most of the rest of the paper and embellishments are from Cocoa Vanilla's More Than Words collection. 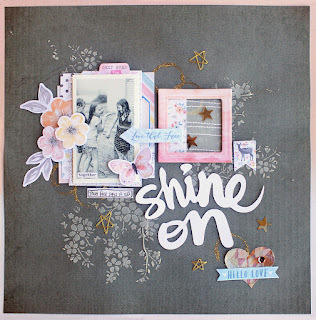 The title I had pre-cut using the Cameo Silhouette. The stars were stitched from my freehand drawings. Happy crafting.